Health Care for the Creative Class! 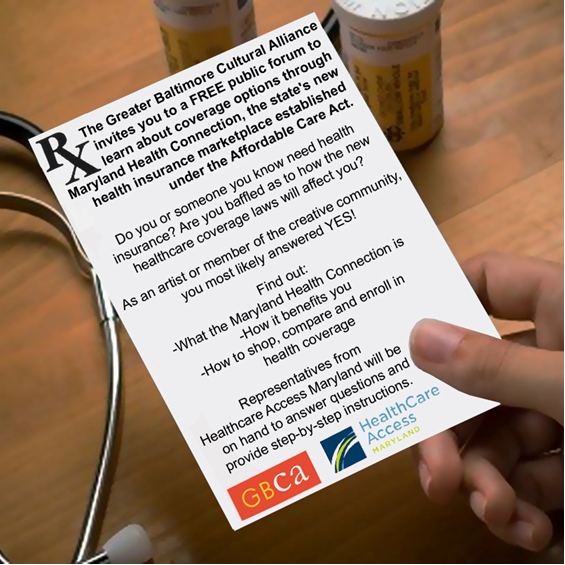 The Greater Baltimore Cultural Alliance invites you to a FREE public forum to learn about acquiring health insurance through the new Affordable Care Act. Now is the time to get in on Baltimore Time Travel Anthology 2! Contact Melody Often for more details. Deadline is quickly approaching. Baltimore Studio Visits from WPA – Apply Now! Washington Project for the Arts has an open call for artists to sign up. They will select 36 artists from the total pool that enter. Maryland Volunteer Lawyers for the Arts (MdVLA) is offering an Art Law Clinic, a legal information service geared towards artists in the greater Baltimore and Maryland community, every other Saturday from 1-4 PM at City Arts, 440 East Oliver Street, in the Station North Arts & Entertainment District. Two volunteer lawyers meet with artists to discuss legal issues, such as business, copyright, or other legal questions regarding their work. Artists can arrange a 30-minute meeting. Contact MdVLA at (410) 752-1633 for more information. 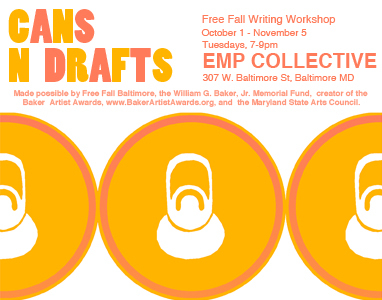 Registration is now open for EMP Collective’s Cans n Drafts Fall Writing Workshop. Cans n Drafts offers a relaxed environment for local writers of all genres and experience levels to congregate and share their gestating stories – from plays to poetry, books to film, and everywhere in between. This fall, Cans n Drafts is FREE thanks to Free Fall Baltimore, so dust off your old notebooks, grab a BOH (or three), and sign up today. Workshops will be held Tuesdays from 7-9pm, October 1 – November 5 and will culminate in a public reading of fresh works on Tuesday, November 5. The Vacants To Value Program is hosting two workshops for homeowners and potential homeowners. Sign up HERE. Seating is limited and pre-registration is required.